Last night when Brianna and I went to Tempe on the light rail train someone stole my bicycle off the back of the camper while parked at the commuter station for the light rail train in Phoenix at the 38th Street Station. It was a little unnerving for both Brianna and me, but I want going to let it take away from all the good fun we had together. We left the parking lot about 7:30 and returned to get her bags to again take the trail to the airport and I found the bike missing. 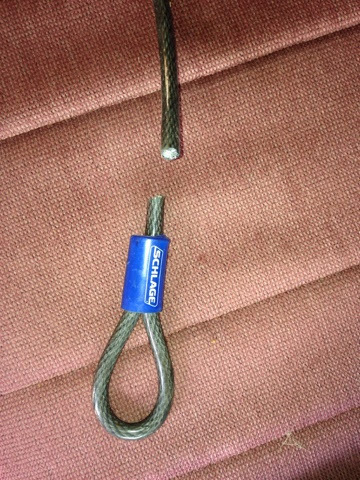 Someone had to have some big cutters as the cable is a security cable made by Schlage the lock company and it is thick. 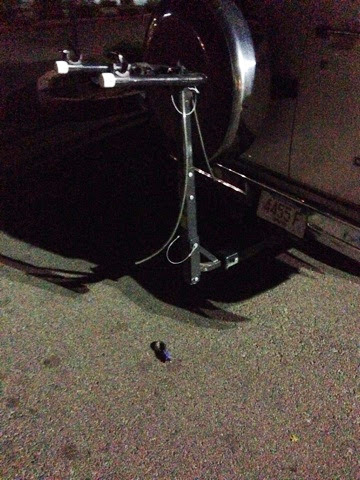 The cable was cut and they cut one of the bike straps on the bike rack. Nearly 8K miles and no problem, even in Las Vegas sitting in the parking lot. Admittingly this section of Phoenix is a bit sketchy, the parking lot is shared with a College and the were in their cruiser when I got back. Yea putting in in the camper every time you park is a pain. Not to be too upset, I always remove my seat! The bike was about 25 years old. Remember my post from my stay at La Jolla where I had a hard time finding break pads as they have changed designs over time. The front derailer wasnt working right as it wouldn't go into the largest gear for high speeds. Once they figure all this out they will not be pleased with their efforts. Also the tires had good tred but the sidewalls had some cracking from age. I will miss my mirror that plugged in on arm hole and the replacement reflector that flashed on the back. Both were decent aftermarket products. Brianna was right. It could have been worse if the broke into the camper and they didn't. I will go to swap meets over the weekend to find a suitable replacement as you never know if it can happen again. I called the Phoenix Police and they offered filing an online report or coming into the city to talk to an officer. They said there was no difference to then other than they type in the report. So I found a safe spot and filed my report in about a 1/2 hour online.